Research led by North Carolina State University sheds new light on the ways in which protons and neutrons can bind and even undergo a quantum phase transition. The work has implications for understanding the connections between nuclear interactions and nuclear structure found in nature. NC State physicist Dean Lee and collaborators are interested in figuring out exactly how protons and neutrons bind to form nuclei. These particles are the building blocks of the universe, coming together to form nuclei like Helium-4, or alpha particles, which in turn play a role in the synthesis of carbon and oxygen within stars. Protons and neutrons can have either spin up or spin down, and these four distinct nucleons can combine to form nuclei. Since two nucleons of the same type and spin cannot occupy the same state, the Helium-4 nucleus is special since it is composed of one of each type of nucleon — spin-up and spin-down varieties of both protons and neutrons. Lee, along with colleagues from Bonn University, Bochum University, Forschungszentrum Juelich and Mississippi State University ran quantum Monte Carlo simulations on a numerical lattice to predict how protons and neutrons form nuclei, and how those nuclei interact with each other. They focused on the form of the interactions among nucleons. Specifically, they considered two types of interactions: local interactions, where the particles' positions relative to one another don't change; and non-local interactions, where the positions do change. Lee and his colleagues ran simulations of nuclei of up to 20 nucleons formed by local and non-local interactions. Their initial intent was to make the simulations more efficient, but they quickly discovered something more interesting. "We found a quantum phase transition we didn't expect to see," Lee says. "When we put two Helium-4 nuclei or alpha particles together using a local interaction for the nucleons, they stuck together, but with non-local interactions they didn't. The interaction between the alpha particles at zero temperature determined whether we ended up with a Bose gas, or a nuclear liquid. 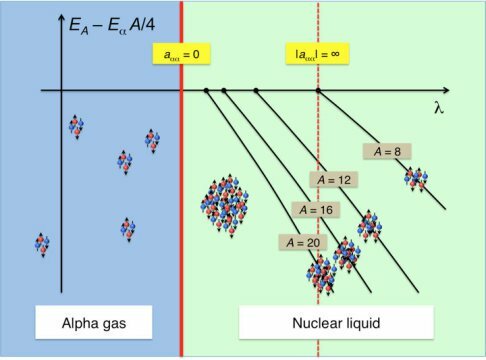 And those alpha particle interactions were dependent upon the strength and locality of the nucleon interactions. "What this tells us is that nature itself is close to an instability we haven't seen before," Lee adds. "If you changed one small parameter, things in our universe could be very different. These simulations offer a great window into how forces are connected to structure." The research appears in Physical Review Letters. The above post is reprinted from materials provided by North Carolina State University. Note: Content may be edited for style and length.